Take a break from the usual sightseeing and shopping and come Play In The Clay with a beginning hand building workshop. Adults and children alike will loose themselves in the magic of working with clay. You will learn the basic techniques of working and building with clay. Each participant will create their very own handmade New Orleans souvenir. 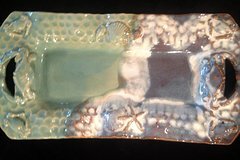 You also take with you some basic knowledge of working with clay and may want to continue the craft with an instructor in your home town. The Workshop Class is scheduled by appointment only. The studio is located in the oldest thriving “Open-Air” market in the United States, tucked deep in the heart of New Orleans French Quarter. This local operator is located in the French Market, Farmers Market at the Mardi Gras Mud by Libby D’s Studio stall #14. This is an outdoor studio under cover so dress appropriately for the local weather. Bring what you would like to drink or snack on while in class. The workshop will last approximately 21/2-3 hours. You will not be rushed to finish your project, so it it takes longer that is okay. This local activity operator offers a hand building workshop which includes,all materials, firing, glazing and shipping of your handmade souvenir to your doorstep in 3-4 weeks after the completion of your workshop. After your piece is created, they will fire your pottery to the bisque stage. Then the final process will be the glaze process in the colors you have chosen. Once completed, it will be shipped to you. Shipping is not included in the price of the workshop and can be paid upon arrival or if you have your own shipping account, we can ship it with your account number. All pottery is double boxed and insured for shipping.